These WOODEN STIRRERS & SPATULAS are ideal for mixing inks, coatings and adhesives. 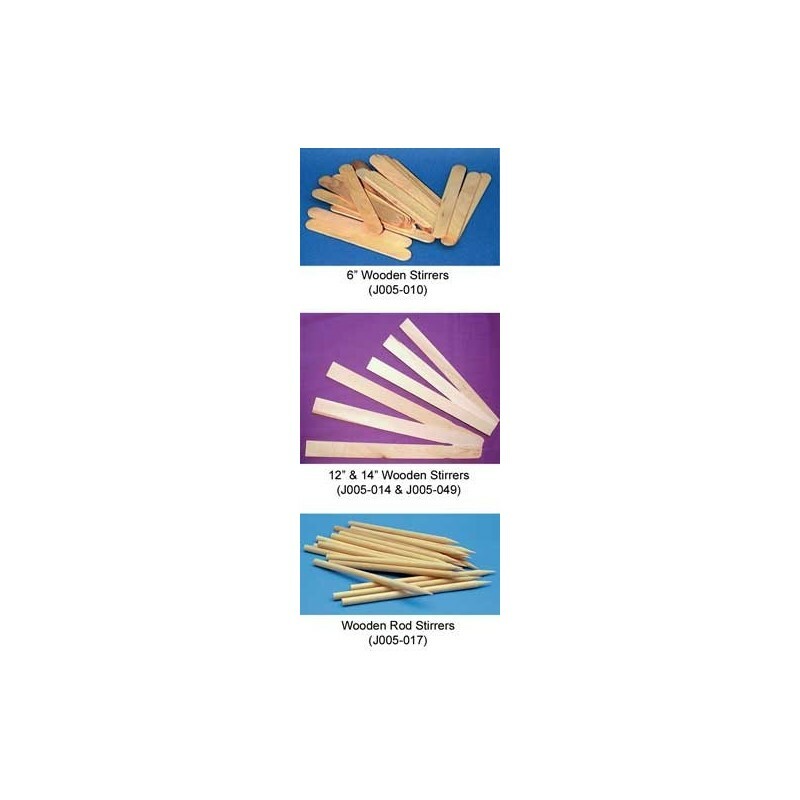 The disposable 6" Wooden Stirrers (J005-010) are made of smooth, straight grained hardwood. They are very useful for mixing and/or dispensing small amounts of inks or coatings. They measure 6"L x 3/4"W. Sold 500/pack 10 packs/case. The lightweight, but sturdy 12", 14", 17.5", 21", and 36" Wooden Stirrers are inexpensive and disposable. They're perfect for use with 5 gallon containers. The 12" Stirrer (J005-014) measures 12"L x 1"W and is sold 1500/pack. The 14" Stirrer (J005-049) measures 14"L x 1-1/16"W and is sold 500/pack. The 17.5" Stirrer (J005-059) measures 17.5"L x 1-1/8"W and is sold 500/pack. The 21" Stirrer (J005-058) measures 21"L x 1-1/8"W and is sold 300/pack. The 36" Stirrer (J005-057) measures 36"L x 1-1/8"W and is sold 500/pack. The high-grade 12' Wood Stirrers (J005-061) are made of sawn pine and are stronger than the standard stirs. They measure 12"L x 3/4"W [5/32" thick]. Sold 1000/pack. Wooden Stirring Rods (J005-017) are strong and sturdy enough for all types of lab, experimental and formulation work. Flat on one side for mashing the other end is pointed for reaching into corners and pinpoint stirring. Easy to use and inexpensively priced for 1-time use. 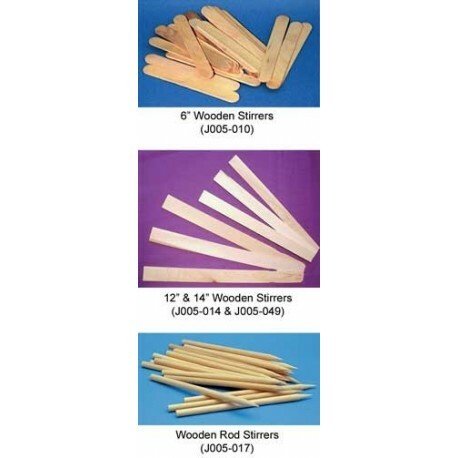 Each Wooden Stirring Rod measures 8"L x 3/8" O.D. Sold 100/pack.